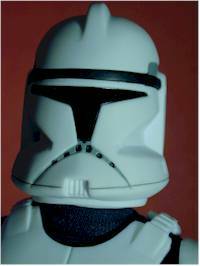 The new Attack of the Clones merchandise isn't supposed to be on the shelf until April 23rd. As a matter of fact, many Toys R Us stores will be open from midnight to 2am just to start the sales with a big bang. However, some retailers aren't doing that good of a job keeping this stuff off the shelf. The figures have made it out at Wal-marts, K-marts, Meijers and even some Toys R Us locations. I found the three new 12" figures at a local Meijers. This set includes Anakin Skywalker, Obi-Wan Kenobi and the new Clone Trooper. They retail for about $22, depending on where you pick them up. 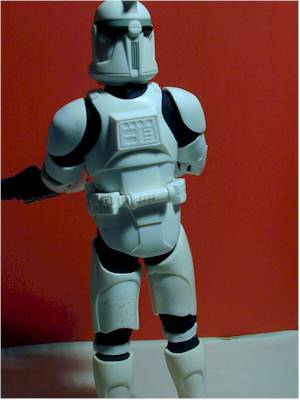 I wish we'd gotten something a little more exciting in this first wave of 12" figures, but the Clone Trooper is certainly the most interesting of the trio. I think this is the highest package rating I've ever given a Hasbro product, particularly a Star Wars Hasbro product. I like the colors and graphics, the boxes are sturdy and should hold up well to shelf abuse, and on top of it all...they are collector friendly! Or at least as collector friendly as I ever imagine Hasbro will get. Snip a couple pieces of tape and you're inside. There are five twisty ties holding the Trooper to the interior card, all easy to remove and put back if you'd like. The blaster is actually attached with a couple rubber bands, and while those look a little trickier to put back, I'm sure you could without too much trouble. We're certainly not talking about a complicated sculpt here. But there are some nice touches, and the sculpt is very clean. The cod piece has a belt as well, with lots of cool accessories as part of the sculpt. The rest of the armor is simple, but well done. I'm not giving the paint ops a terrible score because they are badly done - it's because I don't like what they did with them. 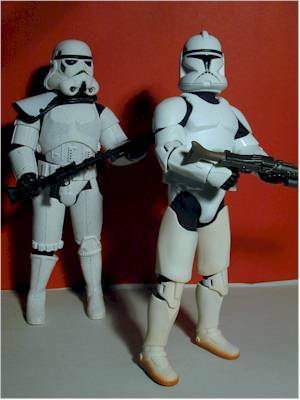 The few painted details that are here are done just fine, but somebody decided to get the bright idea that the Clone Trooper needed to look like Pig Pen from the waist down. 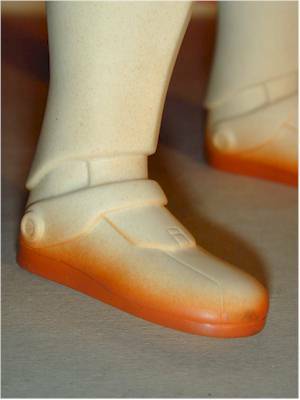 They used a sand colored paint to dust up his feet and his legs, both back and front. But his upper torso is absolutely clean and white - the contrast between the two is completely unrealistic, and hurts the figure quite a bit. 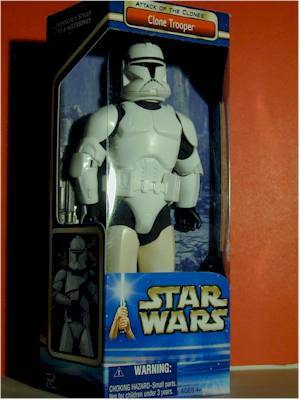 It looks like we got what we expected - the same crummy body we've always had with the 12" Star Wars line. The knees are still clicky, but feel like they have a *smidge* more range of motion. There doesn't appear to be any overall improvements though, and it's disappointing that this line didn't get the same super articulated treatment that the Joe line has. 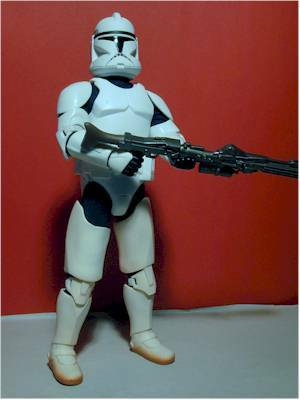 The design of the armor is pretty sharp, and is actually an improvement on the past troopers. The separate elbow and knee pads are held on with elastic, and the shoulder pads are velcroed to the body suit. The body suit fits tightly, and it looks like it would be removable if the armor was. The armor - at least the cod piece and chest pieces - are stitched to the body suit. If you can get the straps at the top holding the front and back piece of the upper body armor together, you can probably take the whole thing off without having to cut the stitches. It doesn't look like a simply procedure though. The biggest flaw though is that the thigh armor is very loose, and tends to droop on the legs. You need to use the knee pads to keep them in place. There's only one accessory, the required blaster. It's all the same color, with a pretty standard Star Wars design. It fits in his hands fairly well, but overall isn't a particularly exciting item. Considering that you can pick up other exceptional sixth scale items like the Brotherhood of Arms figures for $25, or one of the excellent super articulated Joes with a couple accessories for $10, $22 for these is far too much. I realize that Hasbro was taken to the cleaners by Lucas on the cost of this license, and that's partly what drives the excessive prices. That doesn't mean I have to like it. 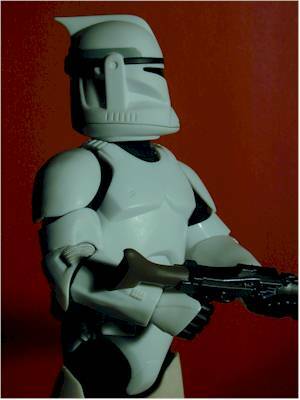 The desing of the Trooper himself is pretty sharp, but that design means they'll look good in the film. It doesn't mean much to a figure with such poor articulation, one accessory, high price, and really awful sand slop below the equator. I'm hoping that the 12" Deluxe Jango Fett is a lot nicer than these first three figures. As I mentioned, there are a few retailers letting these slip out early. I picked mine up at Meijers, but K-mart and Wal-mart have sold stuff as well. But if you can wait til the 23rd of April, you should have no trouble finding these. Heck, I bet we see Target clearancing these out this summer.